Love this piece! 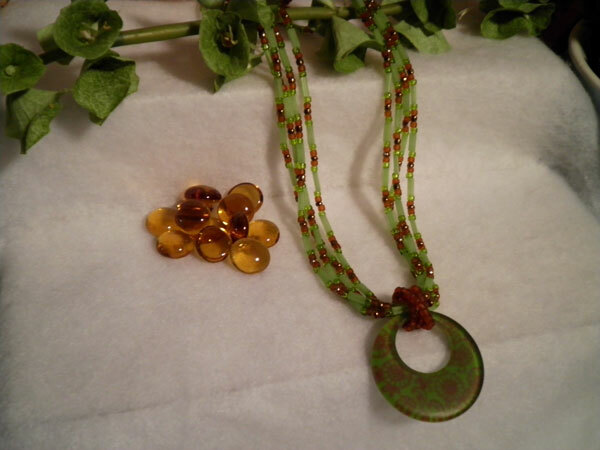 It starts with a green acrylic oval go-go pendant accented with a brown flower design. I've used brown seed beads to attach it as a floating pendant to 4 strands consisting of frosted, green glass tubes, and chartreuse, brown and bronze seed beads. It measures 23 1/2 inches clasp to clasp with the pendant adding another 2 inches. It is finished off with a gold flowered toggle. Can be twisted for a more formal look.